Three of Jupiter's moons cast their shadows simultaneously on the planet beneath them on Friday night and Saturday morning, October 11 and 12. Picture the sun coming over your left shoulder, causing the three moons on the left to cast their shadows on the planet to the right, causing eclipses of the sun in three different locations on Jupiter. Three of Jupiter's largest moons will cast their shadows simultaneously on the planet below them creating three solar eclipses at the same time: a rare cosmic event. A solar eclipse happens when a moon casts its shadow on the planet below it. For observers located where the shadow falls, the sun appears to be completely blocked by the moon. Sometimes, skywatchers can even see the prominences and corona around the occluding moon. Because the moon's orbit is tilted with respect to the Earth, most of the time the moon's shadow passes above or below the Earth, and no eclipse occurs. With Jupiter, the situation is different. 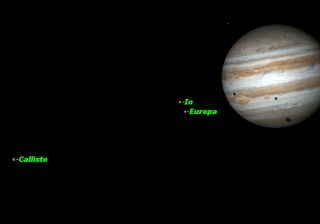 Jupiter has four large moons: Io, Europa, Ganymede and Callisto. These are relatively close to Jupiter and the gas giant is much larger than Earth. As a result, the shadows of Jupiter's moons cross its face very frequently. The innermost moon, Io causes an eclipse on Jupiter once every 1.8 days (42 hours). Even the outermost moon, Callisto, traveling much more slowly, should cause an eclipse every 17 days, but it does so less frequently because, like our moon, sometimes its shadow passes above or below Jupiter. So, if eclipses on Jupiter happen very often, why don't we see more of them? The timing has to be exactly right. Io may cause an eclipse on Jupiter every 42 hours, but the eclipse itself lasts only a little over two hours. Also, Io's shadow is very small; you need a telescope with at least 90mm aperture to see it. If you aren't looking for it, you probably wouldn't see it at all. Also, because of the Earth's rotation, Jupiter is below the horizon half the time, and often lost in the daylight sky. If the shadows of its moons fall so often on Jupiter, what are the chances of two shadows falling simultaneously? Pretty good, it turns out. This is especially true because there is a resonance between the orbits of Jupiter's moons. Europa's period of revolution is almost exactly twice that of Io, and Ganymede's almost exactly four times. Only Callisto doesn't keep step with the inner satellites. As a result, double shadow transits usually happen in a group. The current group started with a double transit of Io and Europa's shadows on September 28 and will continue every few days until Nov. 13. The rarest of all shadow transit events is when three shadows cross Jupiter's face simultaneously, and this will happen on Friday night (Oct. 11) stretching on into Saturday morning. Keep an eye on the moons themselves, because they will also begin to cross Jupiter's disk: Io at 1:48 a.m. EDT (0548 GMT) and Europa at 2:02 a.m. EDT (0602 GMT). There's an added bonus in the Great Red Spot also transiting at this time. It helps to visualize the moons' movements in three dimensions, with the sun seeming to come from over your left shoulder. Sometimes you get an almost three-dimensional effect with the moons casting their shadows on the planet beneath. If you miss this event, there will be three double shadow transits later this month visible over most of North America on October 16 to 17, 18 to 19, and 25 to 26. In each case, the events mostly occur after Jupiter rises around midnight on the first date, so that's the night you should mark on your calendar. Remember that the date changes at midnight.